For today’s Easter card, I thought I’d do something inspired by what I hope to see a lot of: stained glass! I hope I’m seeing lots of old churches in Europe…and perhaps painting a few windows by old glass masters! 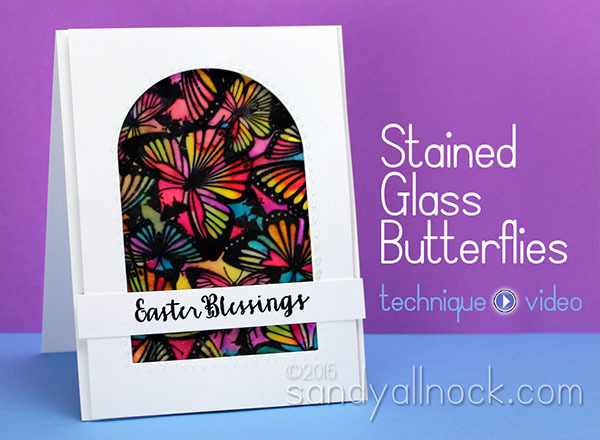 The elegant butterflies from Clearly Besotted were perfect for this technique, with a variety of butterfly sizes. There are lots of flowers that would work with this idea too – anything with small, medium, and large images that can be made into a pattern like this. I’ve used markers to color this, but you can use almost any medium – just make sure you stamp in an ink friendly to your medium of choice. Enjoy the video below, or click HERE to watch in HD on YouTube! This angle shows you that frosted, cloudy-glass look from all that embossing powder. And see those little Glossy Accents dotting around the edge? Sweet! Question of the day…what’s your favorite image for an Easter card? Did a beautiful job on your Easter card and also the floral card where u just pulled out copic markers not looking just pulling them out and using them making them work. Had to try out your technique! Only had watercolor pencils on hand. This is such a beautiful technique! I think the butterflies were a great subject matter. Love the stain glass idea it’s amazing!!!! I absolutely love this card! The colors are so vibrant and who would have thought just a spritz of water would transform ink so much. I think the glossy accent dots are just the right touch to finish off a lovely Easter card! This has the big WOW! factor! This is such a beautiful card and a great technique to try. Than you for sharing. This technique is amazing. I love the colors and shine! Sandy wanted to be sure you know how beautiful this card is. The color is outstanding and you did a great job of creating this. Love your work. Tried to leave a message at YouTube but couldn’t get it to work. I didn’t realize that these markers would re-activate once dry…the misting was fun to watch…love to see the colors move, mix and migrate. Water color is just so much fun! Hope you’re getting to paint some stained glass in person. What a pretty card! 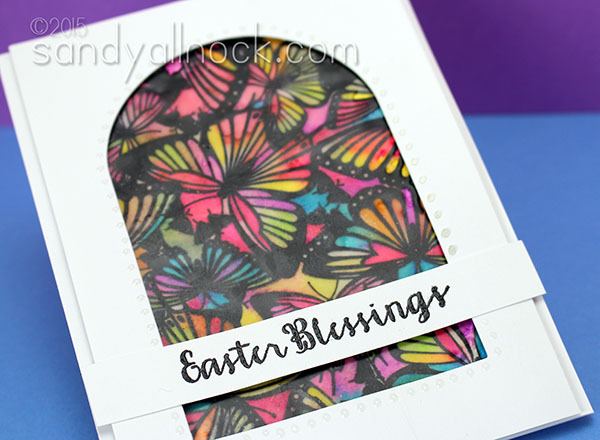 Love that embossing over the colors! Amazing result and so impressive! I love the colors! This is lovely! I’m enjoying all your watercolor examples. Have fun with your travels – hope you’re feeling better. Wow! What a beautiful card and technique! Hope you are enjoying your time in Europe! Absolutely stunning! I hope you are feeling better. I have been praying for your quick and speedy recovery. Really nice! Thanks so much Sandy! Tres Jolie! Love the technique. It truly does look like a cathedral stain glass window! WOW! what a great card. Love the new technique. Thank you for this great video. Stunning Card! I love it. I had to watch the misting part twice because it was so fun and the results are beautiful.